A ladder is a tool which is used to reach the higher places in our home or workplaces. 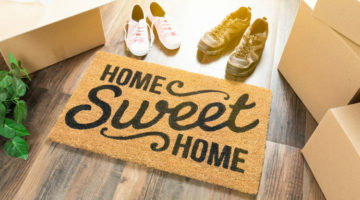 You will need it for taking the kitchen stuff down from the cabinets or paint a wall or maybe hang any family photographs, etc. One can do many versatile jobs with a ladder. 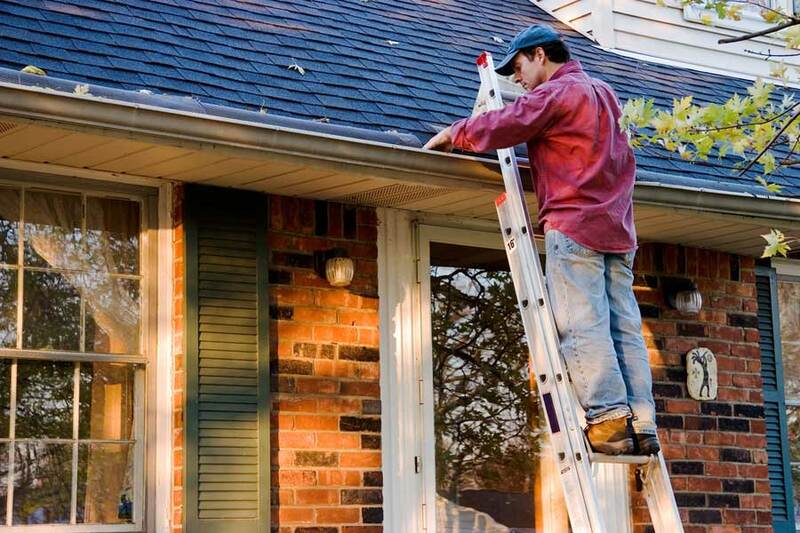 However, you must be careful while choosing the ladder because buying a faulty or weak one can lead to injuries. To help you find the best ladder for home, I will review the finest ladders available in the market. In addition, I will hand out a buying guide to make the decision easier for you. It must be confusing for you to find the right ladder among so many options. However, don’t worry about it because I have selected the best 10 ladders in the market and reviewed them for you. When it comes to ladders, the multipurpose ladders are the best one to choose. They can function as a step ladder, an extension ladder, and even as a staircase ladder. And this unique multi-use ladder is brought to you by the Little Giant. Little Giant is well known in this industry for its great tools. Velocity ladder is one of the greatest products of this company. It is made of Aluminum which makes it durable enough to work in adverse situations. It weighs around 40 pounds and measures about 8 x 27 x 67 inches. For easy portability, there are wheels as well. Moreover, it is affordable than other multipurpose ladders in the market. 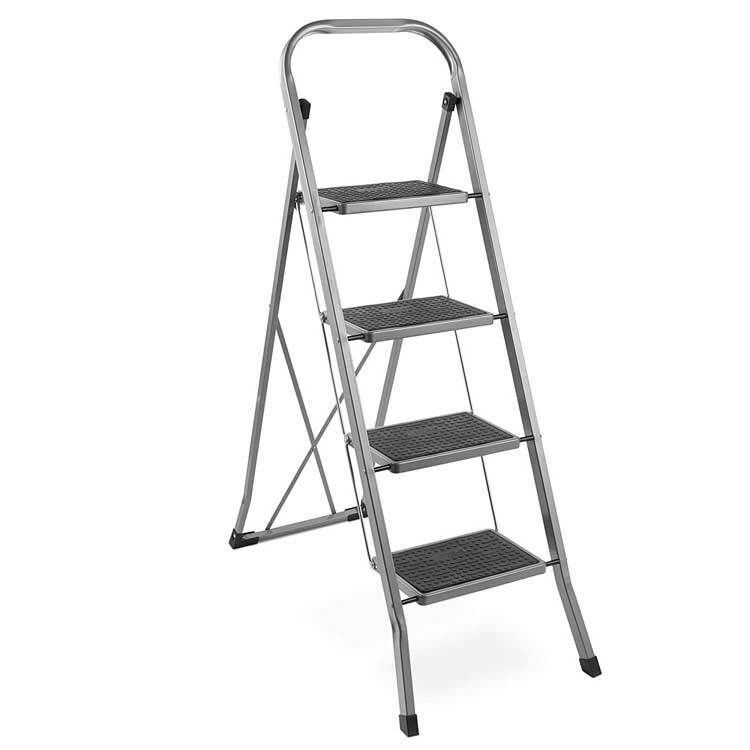 The best part of this ladder is its durability and the multipurpose feature. It can be easily extended to work on higher areas in your home. You can also work along with your partner on this ladder as it is capable of taking a great load. Moreover, it is designed to ensure your safety during work. However, few users complained that the two sliding parts begin to separate and wobble when the ladder is fully extended. This makes it difficult to work for a longer duration on the ladder. Moreover, due to the product being a bit heavy, it’s difficult to carry it around. There is nothing new to say about this company. They are well known for making durable ladders. 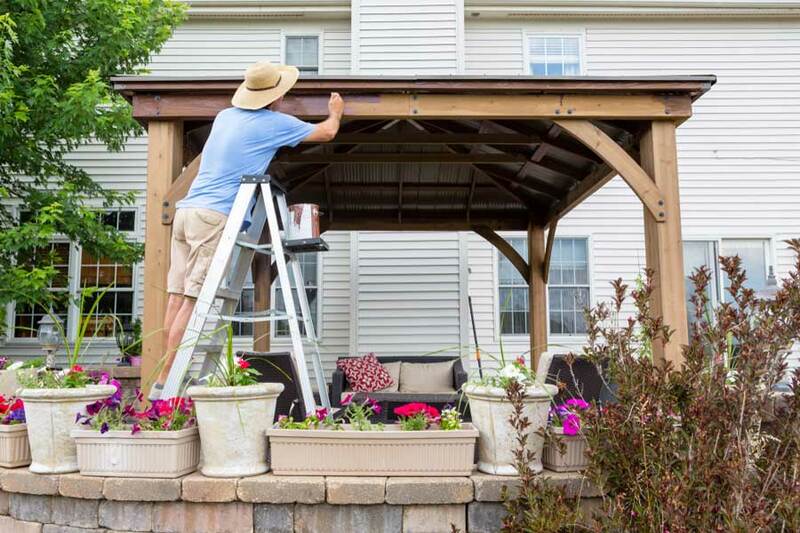 If you like to work in your home as well as outside, this ladder is a must-have for you. This is ideal for doing painting, DIY projects and any other projects that require you to reach high areas. The weight of the product is around only 15 pounds, but it can handle up to 330 pounds which is about 22 times its actual weight. The dimension of this ladder is 29 x 18 x 52 inches, which is perfect for indoor and outdoor alike. Besides, the top platform is big enough to keep all your working tools and painting buckets. Some of the customers had an issue with its plastic handle which seems to break easily after a few uses. Others found it a bit heavier than the original weight stated by the manufacturers. So, it won’t be very easy to carry it to your work station. 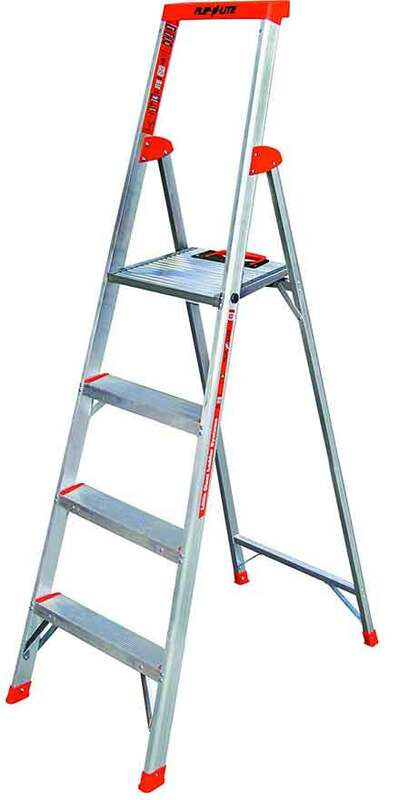 Nevertheless, one of the great features of this Best Ladder for Home is no matter how heavy you are, it won’t wobble when you stand on it, thanks to its safety lock system and well-built steel made framework. Overall, this is a pretty good ladder and deserves a chance from you. 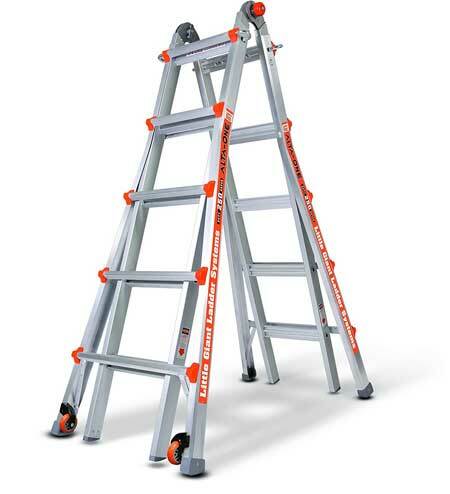 If you are planning to buy a platform ladder at a cheaper price, then this ladder by Little Giant is the one for you. This is the second product by Little Giant to be featured in this article. It comes with 3 steps with a large platform at the top of it which remains sturdy and safe all the time. In addition, its maximum load capacity is about 300 pounds, while it only weighs around 15 pounds itself. Being lightweight, it allows any user to carry it around with ease. Made of aluminum, it is extremely durable, and it only measures around 75 x 21 x 5 inches. Moreover, its safety locking system is very safe and will help you to keep the balance on the topmost platform. You can easily work using your both hand without worrying about an accident. I would recommend this ladder for both professional and homes uses. The only thing people complain about this ladder is that the steps are aligned closely in such a way that when you work on the lower steps, the upper adjacent ones tend to hurt your leg. This can be really painful for anyone who needs to work for a long time. Except this, this ladder is perfect. 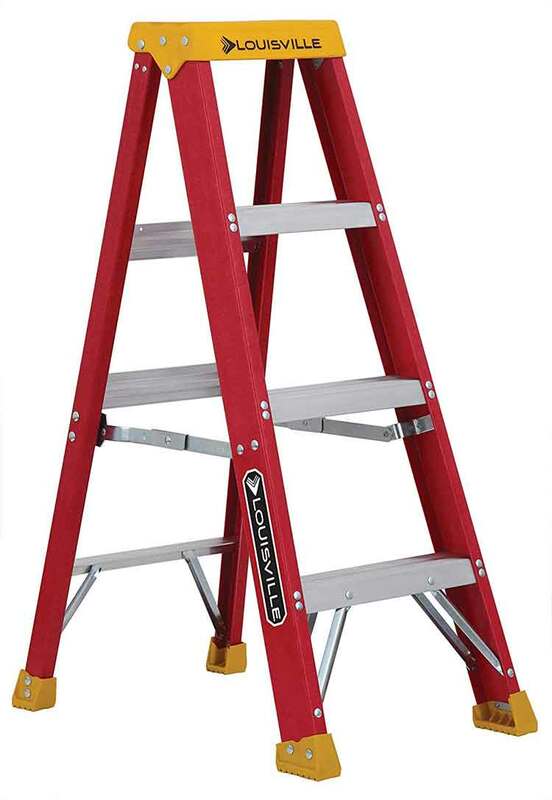 If you are looking for a well-built step ladder for home at an affordable price, then you must give this thing a try. Don’t get deceived by the low price tag. Let me assure you that the makers have not resorted to cutting corners for keeping the price low. Being a type IA, this ladder is built for taking a load of almost 300 pounds. Regarding its own weight, the product weighs only 14 pounds. 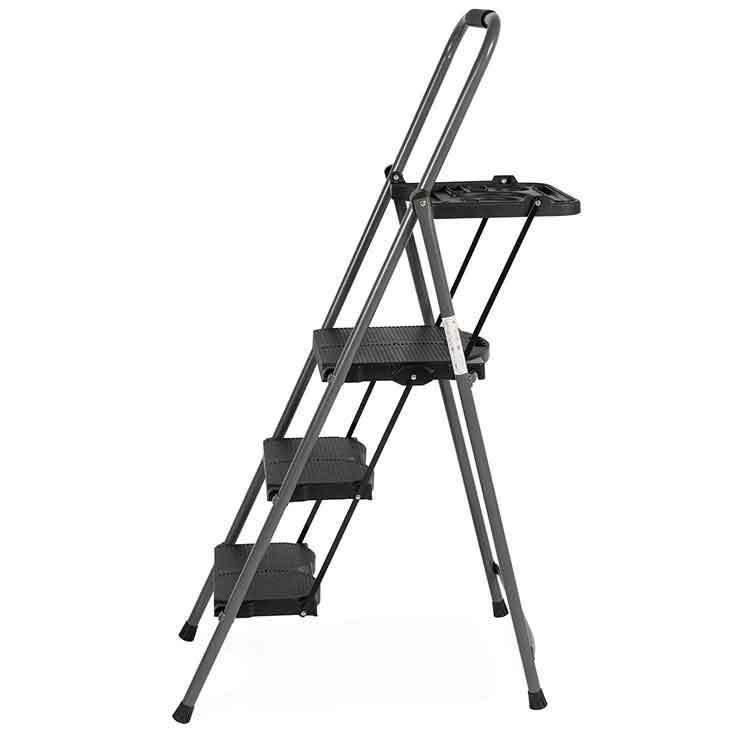 This lightweight feature allows the users to carry the ladder easily to any place. In addition, it only measures around 49 x 20 x 7 inches, which means it won’t occupy much space. To make the ladder long lasting, the materials used to build this thing must be of great quality. Keeping this in mind, the manufacturers have made this step ladder with fiberglass and therefore making it more durable and sturdier. The coolest aspect of this step ladder is its pro-top. This professional top enhances the working quality of the users as there are various trays and other tools to keep your hands free. Moreover, the safety locking system of this ladder meets the different industrial safety standards. However, few consumers found the folding system a bit rigid. But there’s nothing to worry about as majority was completely satisfied with the item. Delxo is a famous name in the ladder industry. This 3-step stool is one of the great products of Delxo. The framework is made of steel and comes completely assembled. You don’t have to buy any extra part for it to get started. 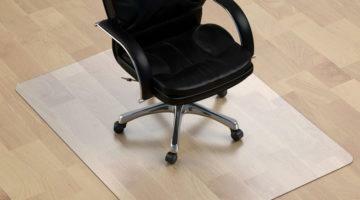 The company is renowned for producing products which offer great security and comfort. This stool comes with a hand grip which enables the users to easily climb and do height works. All the three steps are wide and durable enough to bear your weight and even allow you to sit in them if you get tired. Moreover, durability is one of the best features of it. The weight of this step stool is around 16 pounds with an insane maximum load capacity of 330 pounds which is better than the most type IA ladders. It measures around 18 x 5 x 45 inches. The size of each step is around 30 x 18 inches. Being lightweight, the ladder is incredibly easy to take from one place to another. Nevertheless, people usually complain about the ladder that it wobbles most of the time. The lock system is not good enough and, thus, can cause injury to you. Besides, the top bar is not durable enough and easily bends with a moderate amount of weight. Also, the ladder takes a lot of storage space as the top handle is not straight. Xtend and Climb is one of the finest companies in the ladder industry which produces telescoping ladders. This ladder is exceptionally built using aerospace technology which uses sturdy aluminum metal for durability. Since this manufacturing company always produces top-notch quality ladders, you can trust them. 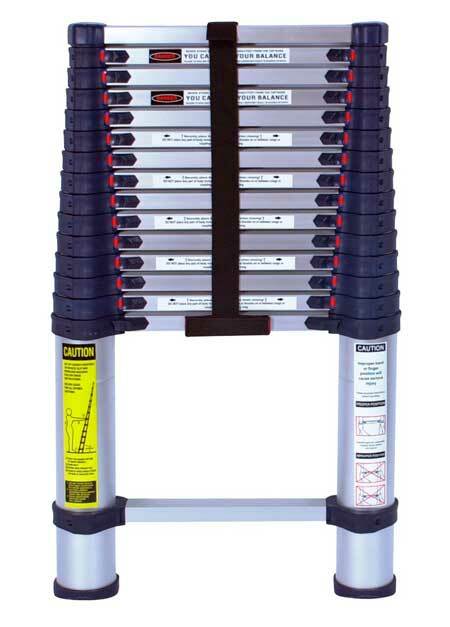 This modern and unique ladder weighs around only 40 pounds with a maximum load capacity of 250 pounds. It can be operated by foot which lets your hands remain free. Moreover, the safety locks are well built, which is a must for working at a great height. 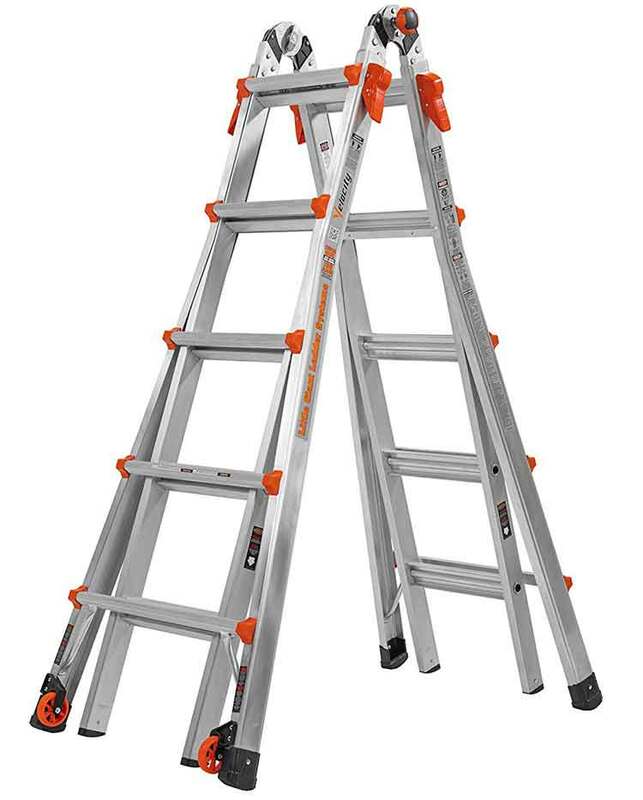 It’s a best ladder for home use, Because operate and relatively safer than other ladders. The height of this telescoping ladder is about 36.5 inches and can be extended up to 15.5 feet. Besides, you don’t even have to worry about the portability of this huge ladder as it comes with proper handles and stronger straps. You can even break it down into several segments which will come in handy while storing it. However, few users complained about the steps’ angle which is a bit steeper and may cause a problem while climbing it. You might also want to be extra careful while you retract the ladder into its original size as it might sometimes cause injuries to your fingers. Overall, this ladder is simply great for any purpose. Nowadays, step stools are widely used instead of ladders for indoor works as they lessen the hassle of the users. So, if you want to buy a step stool but a bigger one than the traditional 3-stepped ones, then this fold able step stool is for you. It comes with 4 steps which are bigger and thus friendly to your feet. The core of this step stool is made of steel which can bear your weight and evenly spread it across the whole step. Despite the fact that it weighs only around 19 pounds, the load capacity of this stool is up to 330 pounds which is truly remarkable. Besides, it can be easily folded and retracted to a smaller size for easy storage and portability. It can easily be leaned against any wall. Another feature I liked the most about this ladder is the depth of the steps. They are neither too high nor too narrow which allows you to climb smoothly without wobbling. However, the only problem it seemed to have is the plastic made steps. This refutes the ‘non-slip’ feature of the stool that the manufacturers claimed. All in all, this is a nice stool to have around if you want to do DIY projects in your house. Delxo is ruling in the ladder industry throughout many years. Their 4-step ladder is as famous as their 3-steps one. This one is specially built for heavy-duty jobs like painting, changing light bulbs, cleaning ceilings, cleaning air conditioners, etc. You can also use it for light works as well. Moreover, this company allows you to return defective products within a limited time. 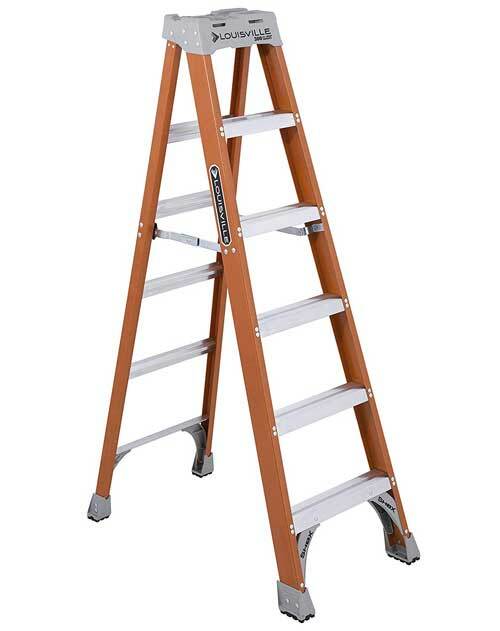 This ladder is very affordable in comparison to other 4-stepped stools that are available in the market. The ladder is easily foldable and thus can be easily stored anywhere. This thing weighs about 21 pounds only but has a maximum load capacity of 330 pounds. The measurement is around 56 x 18 x 2 inches with 10 inches of distance between the steps. This prevents your leg from getting hurt while climbing up. The excellent design allows the user to use the stairs for a longer period of time without getting fatigued. Although the ladder claims to have a load capacity of 330 pounds, a few customers found it shaky while climbing on it. 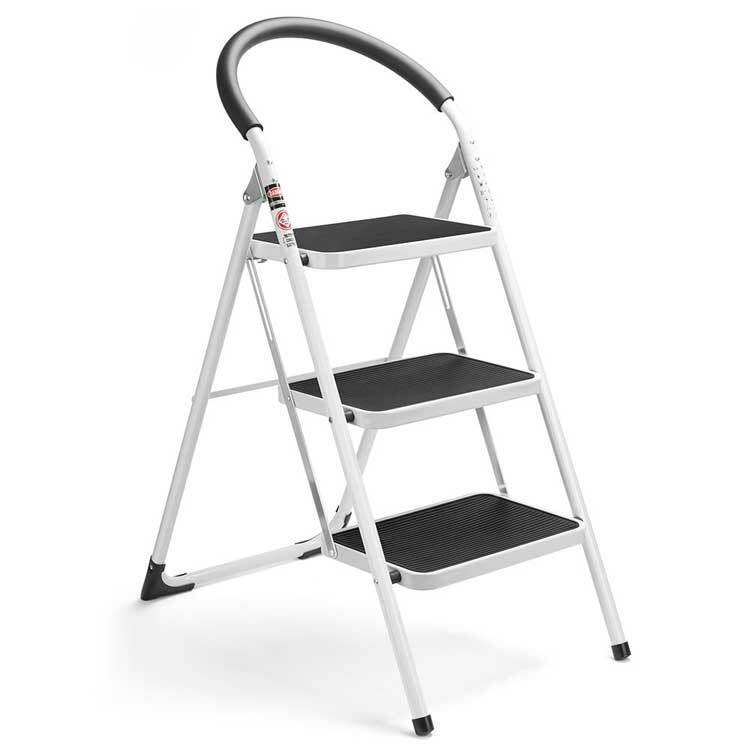 Like other Little Giant products, this ladder might seem a bit overpriced but trust me; it’s completely worth the money. This is a multipurpose ladder which has all the attractive features in it starting from step ladder to the extension ladder and even the telescoping ladder. This one is made of an aluminum core which is of aerospace grade making it super strong and durable for any work. It’s one of the best ladder for home use. The weight of this ladder is around 44 lbs., and the measurement is approximately 27 x 7 x 68 inches, which is ideal for easy storage. Ladder safety is one of the greatest qualities of the products produced by Little Giant which focuses entirely on the users’ safety and thus reduces the risk of injuries. Moreover, you can easily use this thing for any indoor work as well as outdoor projects. In spite of being a great product, few users criticized the safety locking system for being defective. Apart from these few issues, this is an appreciable ladder to have at home for any purpose. Made of fiberglass, it is an exceptionally sturdy and durable ladder. However, I would recommend that you buy it from a trusted seller only, because there have been many reports of fake Louisville Ladder. One of the coolest features of this ladder is the raptor top which has a tray made of magnet that allows you to keep all your essential working tools on the top platform while working. This will free your hands and help you do things faster. Although most of the customers seem to have serious issues regarding its defective shipping, the manufacturers usually replace the defective and damaged parts when contacted. 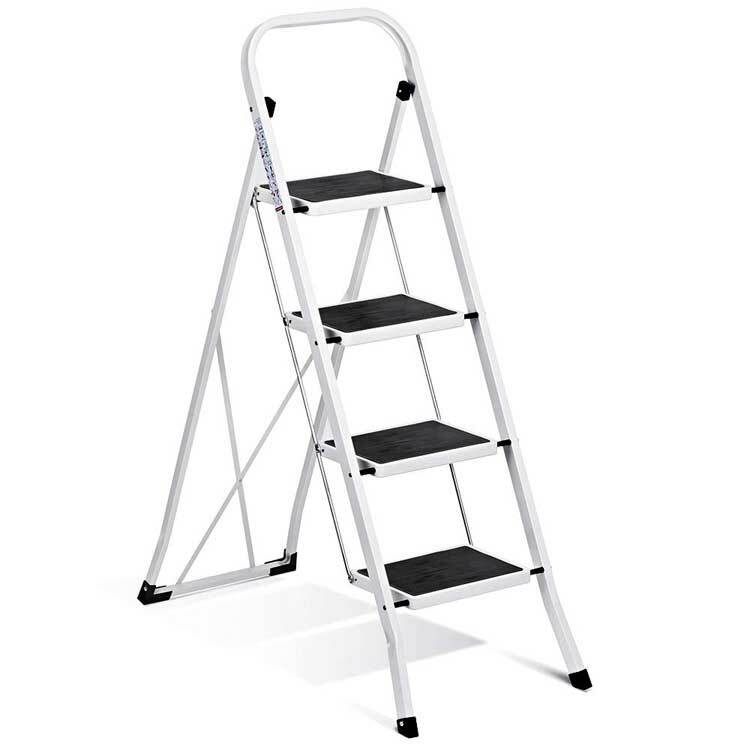 Overall, it is a type IA ladder with a maximum load capacity of 300 pounds which is good enough for most of the tasks. It is easily portable, thanks to its convenient size of 74 x 23 x 7 inches only. There are various types of ladders available in the market. Each one has specific functions and features. This is the type of ladder that usually comes to our mind when we think of a ladder. A step ladder doesn’t require any support to stand. There are two varieties of it; one is the front type, and another one is the twin type. With the front type, you can only climb from a single side, whereas the twin type allows you to climb it with a fellow worker together. This is nothing but a front type of step ladder which has a flat platform on its top. The best thing about this type of ladder is it gives you a great sense of comfort and safety while working on projects which require the use of both of your hands. Step stools have one to two steps. These are ideal for light indoor works. You can use one in your laundry, kitchen, or even in a bedroom. If you are a few inches away from grabbing the desired item, then a step stool can be the ideal option for you. It has two basic parts. ‘The base’ is the fixed part and ‘the fly’ is the mobile part. An extension ladder always needs support to lean against but can be extended as high as one need. However, there are some risks while using this ladder. So, only the experienced ones should use it. These types of ladders are the most convenient option for light indoor works and are also the easiest to store. The lightweight and the folding feature make them best for indoors. Telescoping ladders are widely produced nowadays. These resemble a telescope which can be easily extended for working with ease and can also be reduced to an acceptable small size for easier portability and storage. The name itself indicates what this ladder is able to do. They are a combination of almost all the ladders mentioned above. They are extendable, self-supported, easily foldable, and are portable. People mostly choose multi-purpose ladders for the versatility they offer. Nowadays, many manufacturers are focusing on producing these types of ladders. It won’t help you much if you randomly select a ladder. Selecting a ladder depends on how you are going to use it. For this reason, I have discussed the features you should consider before investing in a ladder. The height is perhaps the most important part of any ladder. Because your working capability and your safety depend on the height. A ladder should be long enough for you so that you can properly set it up. Also, there should be enough space for overlapping sections. And make sure it can be extended beyond your roofline. Remember, a normal person can reach up to 4 feet higher than the actual height of a ladder. Again, you always have to stand a few steps down when it comes to step ladders and extension ladders. However, some companies provide safety height chart from which you can get an idea about which height is ideal for your work. Weight is the second most important thing to consider while purchasing a ladder. All the ladders are designed to bear a certain amount of load, and if it exceeds more than that, the ladder might collapse. There are specific gradings for this, which are known as the duty rating of a ladder. Duty rating is the maximum weight a ladder can carry. And when you climb on the ladder, the overall weight (aggregate of your weight and the weight of the tools) must always be less than the duty rating. For light duty work, you can go for type III which has 200 pounds of limit. For simple basic works, there is type II with 225 pounds of load limit. Type I is widely used for the projects which have 250 pounds of load capacity. However, for tough and heavy duty works, there are type IA and type IAA with the workload of 300 pounds and 375 pounds respectively. So, before buying a ladder, think about the nature of your work and of course your own weight. With time, ladders have evolved a lot. Now there are several types of ladders that are available in the market. You have to select the ladder type which suits all your requirements. You have to choose among the step ladders, platform ladders, step stools, extension ladder, telescoping ladder, folding ladders, and the multipurpose ladders. A step ladder is the most common type of ladder and is readily available. They are one of the oldest ladders. A platform ladder is comfortable and safer than the step ladder. In fact, a step stool is basically a stool or a mini ladder for indoor projects. 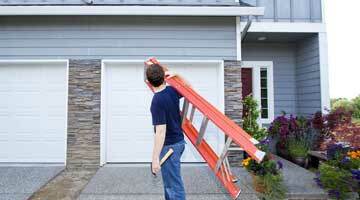 An extension ladder is comparatively new in the market and can be extended as long as one wants. It gives you a better working experience while working on ceilings. Folding ladders are ideal for indoor works as they take very small storage space. So, if you don’t have much space in your house and aren’t able to accommodate a large ladder, then folding ladder is the right option for you. The telescoping ladder is another modern version of the extension ladder. They have versatile uses and are worth looking into. Lastly, a multipurpose ladder is a combo of every ladder out there. If you use ladders a lot, then you’d do well to get a multi-purpose ladder. 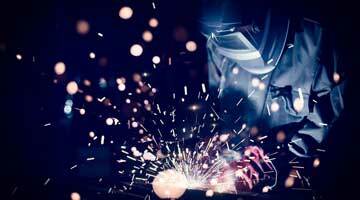 The safety of the workers also depends upon the material with which a ladder is made up of. Especially if you’re planning to work near any electric source or chemical sources, you should keep in mind about the material of the ladder. Ladder made of aluminum or fiberglass is the most durable and ideal for working in rough environments. Imagine that you are working on a tall ladder and then suddenly you lose your balance and fall on the ground! That would be a nightmare! To avoid such hazards, here a few tips on how to secure a ladder and how to tie off a ladder for safety. Always check the maximum capacity of a ladder before you climb on it. Regarding height, consider the taller one as it will help you to reach higher areas easily. While working, stay away from the top two steps of step ladders and extension ladders for maximum safety. Don’t carry the working tools in your hand while climbing. Focus entirely on the steps and concentrate on the distance between two adjacent steps as you climb up. For carrying the tools, use a rope or belt around your waist. Never ever place your ladder on any uneven surface or ice ground. If necessary, you can dig and remove some of the soil to make the base even; this will keep the ladder firmly stable and steady on the ground. This is very important when it comes to the extension type of ladder. Before climbing on the ladder make sure ‘the base’ and ‘the fly’ portion is safeguarded with a lock. Otherwise, you might slip and injure yourself badly. To avoid an accident, place your ladder neither too close nor too far from the supporting wall or tree. It is wise to keep the ladder base 1 foot away from the wall for every 4 feet of height. For example, for a 12 feet long ladder, you should place its base 3 feet away from the wall. Choosing the right ladder in not an easy task. You have to consider so many things such as height, weight, and materials. Nevertheless, I’m sure the buying guide I provided will be of some help to you. Also, the reviews will help you to select the best ladder for home use. Nonetheless, let me know in the comment section which one you’re going with.